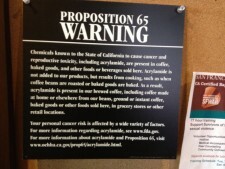 ACSH has taken on the anti-scientific and anti-business Proposition 65 in California on numerous occasions. In fact, we have a publication devoted to the subject. Passed overwhelmingly in 1986, the law requires labeling as a carcinogen or reproductive toxicant for any product known to the State of California to contain a substance or chemical shown, in any system and to any authoritative body, to have such possible effects. While possibly well-intentioned, the effect of this statute has been nil regarding public health as neither the level of exposure nor the testing system is taken into account when identifying carcinogens but has successfully stifled businesses in the state. And anyone who has read our Dispatch and/or followed my media profile knows my strong position supporting e-cigarettes/vapor products as a relatively safe and effective method to help smokers quit, and is aware as well of the crescendo of anti-e-cig studies and alarmist warnings from our public health establishment. This unscientific data distortion reached a sort-of pinnacle (or nadir) recently when the California Dept. of Public Health issued a booklet, State Health Officer s Report on E-Cigarettes, A Community Health Threat. I addressed that propaganda piece specifically. So it makes perfect sense, in the perverse world we seem to be living in, that the cottage industry of lawyers who make a good living suing businesses who flout the legal strictures of Prop 65 would target e-cigarette marketers. The Center for Environmental Health (CEH) has now announced their intention to do so, sending warning letters of imminent litigation to over twenty CA vape shops and retailers of e-cigs. The fact that most (not all!) such products do contain nicotine, and that nicotine is indeed on the Prop. 65 list, should have warranted (according to the law) a warning label. (In the state, it s common practice for businesses large and small to simply put up or post such warning labels routinely: they are omnipresent, even in building entryways, and are completely ignored by the populace, except for Prop. 65 lawyers). However, now posing as concerned about the children, CEH has gone even farther. The group s spokesman, Charles Margulis, added these non-Prop 65-related goals to the mix: In bringing legal action, CEH expects to pressure the e-cigarette industry to conform to legal requirements for labeling and create mandatory product safety standards. CEH also aims to pressure the companies to stop marketing practices that target children and teens. The official alarm against e-cigs by the CA Dept. of Health which by the way echoes the current anti-scientific approach taken by every official in the public health arena these days, contrary to their sworn mission was a huge signal to the lawyers always trolling for Prop 65 victims to intimidate and extract money from, as if one were needed. Given the legal strictures there, I suppose the products should bear the label, but the CEH people have absolutely no standing to call for more stringent advertising and packaging regulations than the federal agencies, or even the state agencies, do. That said, we here at ACSH agree that childproof packaging is a good idea for e-liquids.